The joke about Whole Foods is that it should really be called Whole Paycheck. I’ve never found this to be the case–the trick is to shop wisely! Here are my tips for how to save money at Whole Foods. Don’t have an all-or-nothing attitude about organic produce. We can’t afford to eat organic fruits and vegetables exclusively either, so I usually only buy organic when it comes to Dirty Dozen. What’s the Dirty Dozen, you ask? It’s a list of the fruits and vegetables determined to have the greatest amount of pesticide residue by the Environmental Working Group. 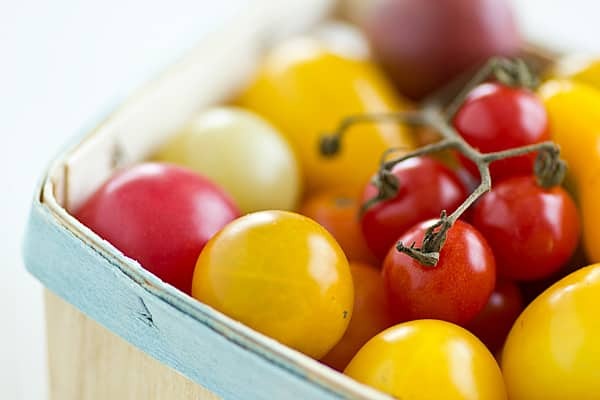 Included in this list are: celery, peaches, strawberries, apples, blueberries, nectarines, bell peppers, spinach, kale, cherries, potatoes, and imported grapes. These are the fruits and veggies that you want to buy organic. Buying local and in-season will help you save money at Whole Foods as well. You’ll only save a few cents, but every little bit adds up. Plus, it’s the eco-friendly thing to do! This is the best tip I have. I can get soymilk anywhere. Newman’s Own? They have the entire line at every grocery store in the city. But if I want a package of tempeh, Whole Foods is the only place that has it. So look at Whole Foods not as your sole weekly grocery trip, but as a supplemental one. Buy the staples and such somewhere else and at Whole Foods buy what other supermarkets don’t carry. The caveat to the whole “concentrate on things you can’t buy elsewhere” thing is that sometimes you can find things cheaper at Whole Foods. Remember, Whole Foods has its own organic house brand, while most other supermarkets do not. So if you have a choice between name brand tofu at your local grocery store or 365 Everyday Value tofu, you are likely better off choosing the 365 version. You’ll find that some other products are cheaper at Whole Foods as well–know which products these are. This is a tip that can save you money anywhere, really. Whole Foods has a fantastic selection of bulk products. Make use of it! I know this is a tough one–I love the bakery and prepared foods sections at Whole Foods. But they are crazy expensive! For me, getting anything from either of these departments is a rare treat, not something to do on every shopping trip. Check out the Whole Deal newsletter before you go shopping. A lot of times you’ll be able to find manufacturer coupons to combine with Whole Foods’ in-store coupons–ca-ching! And don’t forget to pick up a Mambo Sprouts booklet in the front of the store if they have them. 8. Don’t deviate from your list. And don’t go shopping while hungry. It’s of vital(!) importance that you stick to your list when you go to Whole Foods (unless you find a super deal–then you can make an exception). The easiest way to do this? Go right after you’ve eaten a meal. Do you have any other tricks for saving money at Whole Foods? Don’t keep them to yourself–share them here! I love shopping at Whole Foods but it is very expensive. I usually start at Trader Joes and try to buy as many things there as I can. Then I go to Whole Foods to finish my shopping. The bakery is hard to resist but the prices on those cakes are just ridiculous. My tip for shopping at Whole Foods if you want to spend less money is to go with your kids in the middle of the day on a weekend. It is so busy there that you will want to get out of that place as soon as possible. Stopping by from the Fun Follow Friday on Simply Stacie! Great information! I didn't realize that there were foods with higher amounts of pesticides placed on them. I will definitely be searching for these foods organically from now on. I found you through the Friday blog hop, please be sure to come back and check us out. Thanks for the great tips… especially the "dirty dozen!" We go through several pints of strawberries and blueberries each week and I didn't know they would be on that list. I wash them pretty good but still! Thanks! Following you from TPRP! Great Tips! I make sure I pickup items at other stores if available and pick up those items exclusive to whole foods. For instance, the Naked juice I buy is $5.00 at Walmart for the BIG size. It's more than half for a single serving at Whole Foods. Every penny counts! Great advice! I love Whole Foods and I've saved up to 50% on my bill a few times by using coupons. I found you on the Relax & Surf Sunday Blog Hop! Come check out my blog and follow me if can! There are NO Whole Foods where I live. But I have wegmans. It sounds like they are fairly similar in makeup, and I have a hard time telling people how good the prices are once you get past the gourmet. It's hard walking past the gourmet. I'm stopping by from the relax and surf blog hop, gave you a follow, I'd love it if you returned the favor! popping in from Relax & surf! thanks fot the tips for shopping whole foods. I dont go too often due to blowing way to much money!